Sammer Meets T. A. Barron! I got to meet T.A. Barron because we are friends with people who work at Park Road Books. They know I like his books. So when they knew he was coming, they called me. 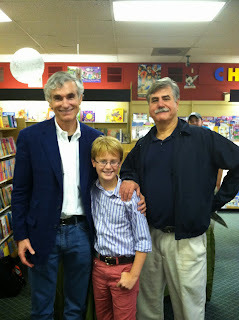 They offered to let me spend the day with him and to interview him because I write for the library blog Boys Rule! Boys Read! I was very excited. I also got an advance copy of his newest book Atlantis Rising. It is very good and I have read it and reviewed it on the blog. We first went and ate lunch at Sir Edmond Halley’s. While we ate, I interviewed him. My experience with T.A Barron was amazing. He had very good details in his regular speech. It was almost like he was writing a story right then and there. 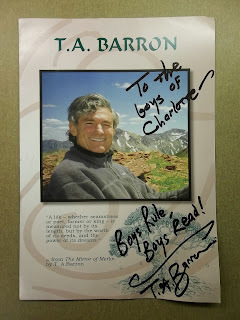 T.A Barron was taller than I expected. In his picture he is wearing a jacket so it makes him seem short. But when you meet him, he is about five times bigger than you would expect. We also talked about parts of his books that I liked. He asked me if I knew that a character in one book was Merlin in disguise. And he also said he knew for five years a secret about a character before he could put it in his book. Sam: What made you want to write about Merlin and Atlantis? TABarron: Both Merlin and Atlantis are among the most cherished characters and stories out of myth. Both have many centuries of song, story, and legend—every form of storytelling—but both have a gap. Merlin, whom we know from the Celtic tradition, when his story was written down from the oral tradition in the 5th or 6th century AD by a monk, and from the Welsh story known as the Mabinogion, has had his story told and Yet almost every time he appears in this rich and luminous and beautiful tapestry of myth, he is an old person. The hole in that tapestry was his youth. It was my job as a writer to fill in this hole, to attach it to the other stories, but to be original at the same time. Merlin, who is so wise in all the legends and myth, gains his wisdom from experiencing human frailties and greatness not on just one side. He has both dark and light inside, which is why he can be such as great mentor. Atlantis is the same principle; we have heard about Atlantis for more than 2,000 years, since the ancient Greek philosopher Plato wrote about its destruction. But how did the place become so magical? What was its creation story? Plato’s story is a parable about how a very successful society fell into its own destructiveness. It is a morality tale. So now that name Atlantis is a symbol for any lost paradise. I worked for 17 years on Merlin’s story. And when I finished, I wondered what myth would capture my attention and call to me. What appeared was the Atlantis story, which also had a gap that became my task as a writer to fill. It’s been fun. In The Ancient One, I got to draw on a lot of Native American lore. Sam: What inspires you as a writer? TABarron: Nothing inspires me more than talking with bright, intelligent young people. I have five at home, my five children. But being out in nature also inspires me. It was no accident that I was drawn to Merlin. He’s a Druid. The Hero’s journey also never fails to lift my spirits. A hero is a person who has to dig deep to save not just themselves but the world. They have to have courage, perseverance, hope, faith, and honor. But it has to be earned. And the journey is all about that. Good fiction must be true. It must be authentic. That needing to be true is especially true in fantasy. Not that the events actually happen, but that there is enough detail to feel authentic, so that the reader is willing to allow the book and characters to be a part of their lives. In the first few pages of the first Merlin book, when he as a young boy washes up on the beach, I had to make sure that all five senses were present on the first page so the reader would believe. Sam: When did you decide to be an author, and why? TABarron: I first had that dream when I was 7 or 8 and was sitting under the apple tree on my parents’ ranch. I wanted to write. By age 9 I had started my own magazine, called “The Idiot’s Odyssey.” It was all about exposes of secret truths. I wrote one on what went on the teacher’s lounge—and got in a heap of trouble for doing so, because what I made up was too close to the truth! I never really believed I could do it [be a writer], but I knew it would be the happiest life for me. My big influence was my mom, who read aloud at home to us all the time. After college, I went to England to study at Oxford as a Rhodes Scholar. I travelled widely, in Asia and Africa, dong all sorts of odd jobs. I was a roof thatcher and a luggage carrier at the base of Mount Kilimanjaro. And during that time I wrote my first novel. When I got back to Oxford, I sent out my manuscript to 32 different publishers, expecting that one of them would publish my novel, and then I could move to a mountain cabin and write. In one month I got 32 rejections. Some were pretty brutal. My dream was shot. So I moved to New York City and worked for a company that invested in environmental issues. But I got up early every morning and wrote. I sat in the back of meetings and wrote. That was 23 years and 25 books ago. If you have a dream, it is essential that you follow that dream. Thanks, Sammer, for sharing! And you did a very good job with that interview. We are very proud of you! 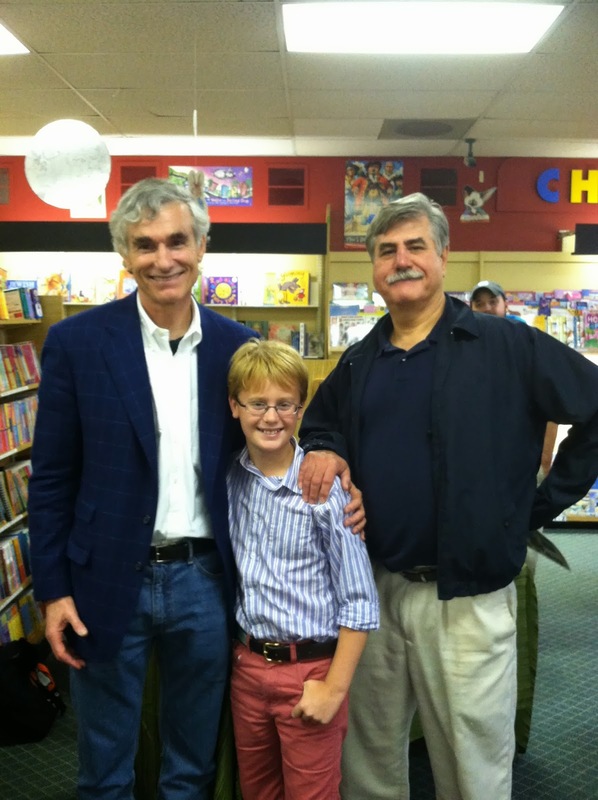 "To the boys of Charlotte--Boys Rule, Boys Read!" Ain't it the truth! Thanks, Mr. Barron and thanks again, Sammer. Keep in touch, both of you! PS--if you want to see Sammer's review of Atlantis Rising, click here. Jonah, Katherine, and Chip have been kidnapped by a missing kid from history! That's a little different. The kid has also kidnapped his would-be sister from history. Who are they? Alexei and Anastasia Romanov, from the year 1918. Their father, the former tsar, and their whole family have been kept under house arrest, and little do they know that they're going to be executed that night. The Elucidator that Alexei kidnapped them with was from Gary and Hosge, who got him working for them on a basis of lies. They've dumbed down thus Elicidator, so they're all stuck in 1918! So the team decides to rescue the entire Romanov family, not because it alters history, but because they believe that this is the way time is supposed to go; that even original time is wrong. Things really pick up when Gary and Hodge themselves return! Don't miss this epic story, much better than Caught. And the last book, Revealed, is set to come out... some time. Dak, Sera, and Riq have gone to the Maya Indian culture in the seventh century. I can't say much about the plot as just one thing could ruin the book. But it is better than the last one, as the travelers go to the same place twice, but a thousand years apart, and the two periods intertwine. Also, Sera remembers what she saw when she warped to the Cataclysm, and she and Riq deal with conflicting emotions that determine what kind of person they are. Also, this book has some pretty good action. It's a step in the right direction for this 39 Clues copycat series. Book 5, Cave of Wonders, comes soon. The fifth book, but ninth installment in the Infinity Ring series. This time, the three travelers are faced with the destruction of Baghdad in 1258. Hulagu Khan, grandson of Genghis Khan, has taken many cities and hasn't lost a battle yet. And now he's coming for Baghdad! What's the big deal? There's a huge library in Baghdad in 1258. It's called the House of Wisdom, and in it is Aristotle's writings about the Prime Break, the Break that will make or break all of history. But according to history, Hulagu burned the library! Sera, Dak, and Riq must save the book before it's too late! Personally, I think the series is stepping up a notch in this book. The author did a great job of adding suspense with wild animals and chases, and he also added some originality to the series (finally!) with the probability that the trio will have to return to the present at some point. Although they didn't in this book, I hope they will in a future book and not in an online episode. Plus, the more Dak's parents and Riq's possible non-existence are mentioned, the more this series separates itself from The 39 Clues. And even know the book had no guns in it, it was still very exciting. Finally, a book in this series has my recommendation, and I actually enjoyed this one. I just really wish they would stop doing the online thing. Ain't nobody got time for that! Anyway, book 6, Behind Enemy Lines, by Jennifer A. Nielsen, is coming soon. And in conclusion, I want to say that I have high expectations for this book, because it is a World War II spy novel! Plus, as the series has improved a little with each book, I hope and expect this one to be the best one yet! Thanks, Michael! You've been good about sticking with both these series even when they didn't start off well. I thought the Missing books would be just another time-travel series and the second book sure looked that way. And I thought Infinity Ring would be a 39 Clues knock-off. But you're telling us that they're getting better as the go along and I'm glad. Take a look at these, guys, and see if he's right! Keep up the good work, Michael. Can't wait to hear from you again! Barbarians + Swords + Evil Wizards + Hot Wings = FANGBONE! Graphic novels are great entertainment for guys! Let's establish that fact right away--and you probably know it already. Lots of guys have told about their favorites--Bone, Mad and Chad, Amulet and more. Today I'd like to tell you about a new series that I'm absolutely crazy about--FANGBONE!, THIRD GRADE BARBARIAN by Michael Rex. These graphic novels are hilarious, action-packed, and some of the most entertaining reading you could ever hold in your reader guy hands. In the land of Skullbania, a group of barbarian warriors hold possession of the big toe of Venemous Drool, the evil wizard. Drool's army is approaching and someone must take the big toe to a magician who will send him to another land. The only one who cannot join in the battle is Fangbone, too young to fight. The magician sends Fangbone to the other land, tells him to protect the big toe at all costs, to blend in and not attract attention to himself so that Drool's minions will not find him. "May the spirit of Bigbelly Blackspit go with you," he says. Fangbone lands near a school and follows a boy named Bill into Class 3-G, a class where everyone "learns at their own speed." Fangbone tries to blend in but it's hard to blend in when you wear a helmet with horns and a sword to class. Drool's monsters find Fangbone, however, and attack. Can Fangbone survive attacks by Dirt Devils, giant bat monsters and pop quizzes? In the second book, Fangbone and the Egg of Misery, the warrior clans try to send a feast to Fangbone ("Stewed maggots! Twice-cooked gizzards!Fried Snake Eyes!") but Drool's minions switch the food for a giant egg. Fangbone thinks it will hatch a "Titan Razor Dragon" that could surely defeat the evil monsters of Drool. But something else will hatch instead--something deadly! Can Fangbone, Bill and friends ever hope to survive--and finish their presentation at the science pageant? In the third book, Fangbone and the Birthday Party of Dread, Drool sends his most powerful monster yet after Fangbone. It's the Crusha and only one warrior, Bigbelly Blackspit, has ever escaped. How can a third-grader, even a barbarian, hope to get away? Even more than that, can they pass the Invention Convention at school? These books are great!! They have attacks by Turtle-Gators, stories of old barbarian mythology (like why the sun is a flaming eyeball), bullies with fire truck underwear, the Ooky Dooky Dance and an evil bouncy castle. Plus, they're a testament to the power of courage and friendship. Have I got your curiosity up now? Then go and check them out! 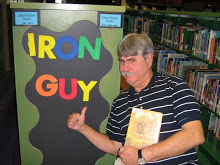 These books get the Iron Guy Seal of Approval as Three Terrific Books! 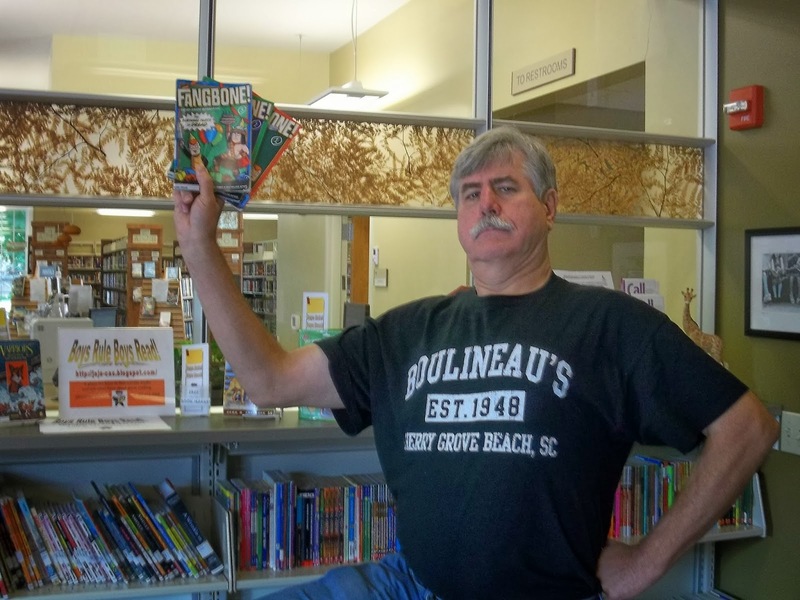 Get to your local library and demand Fangbone, Third-Grade Barbarian--but leave your sword and evil big toe at home.